Hello friends, I created a custom profile fields for gender (Male / Female) in my website to appear below the avatar, everything is working fine but I want to change the text (Male / Female) for images, does anyone know how to do this or know any tutorial about it, please? Sorry if this is not the correct place for this topic. Would this link put you on the right track maybe? Hi, may I ask if you are talking about Icy Phoenix or phpBB 3? Joshua203 thank you, i tested the mod/genders but i did not like the result and also will be one more mod to upgrade every PHPbb3 update, i prefer to use "Custom Fields", so i will not have this preoccupation. Mighty Gorgon Yes i use Milky Way but frankly i do not know if it is editing the template files or in phpBB3, i need to learn how to replace texts (for an image) of a custom profile fields that appears below the user avatar in the current case, "Genders", if possible with this, i will make with others in the future. 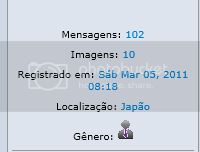 I think using images is not posible in ACP > profile fields if you not change other code. I have even installed this thing now and am editing (or trying to ) the stuff I want to look different (in black pearl) ....I think this would be the best way!! Can you try and explain what you did not like about this mod? ... MAYBE I can try to help? Joshua203 thanks for your help, have a few days I'm testing this mod but when I solve one problem another one appears. Now I have an error message (in my opinion a mistake) "The value you entered is too small. ", that is displayed when the visitor does not choose an option gender to register. It would be ideal "The Genders field must be completed", is it complicated to solve this? setting a default (for if the user forget to choose) would avoid this message, that would be easy! ..but maybe not what you want. I will try and modify my own setup so that it demands a gender choice on registration to try and get some idea and test a bit. meanwhile can you try this and let me know if this helps? Depending on how you modified your code to make it a forced field on registration the above will probably work. One of these will work, you have to add it to the bottom of the common.php of your language directory (with the other gender translation lines)...My bet is that the first one is good for you! !